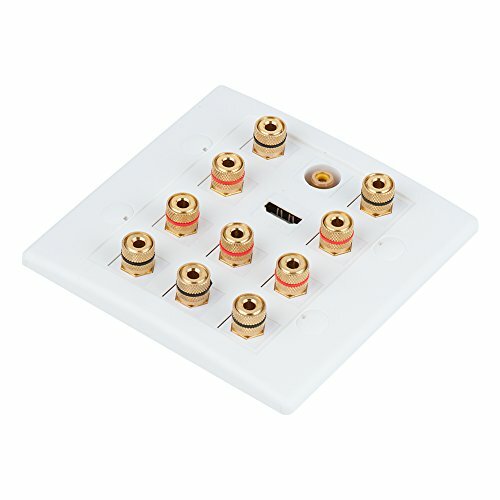 MACTISICAL Banana Plug Wall Plate may now be your best choice for your home theatre setup. These are gold plated connectors that maximize conductibility for optimal transmit quality while preventing corrosion, wall plate with high quality gold plated binding posts for speakers. Port Included: 5 sets for speakers, 1 set for HDMI, and 1 set of subwoofer. Please do not hesitate to contact us if there's any problem or question about our products. We will keep improving our products and service, and try our best to meet customers' needs. Thank you for supporting MACTISICAL.